Yamaha's excellent Broadbass series of bass guitars have been round for 40 years now which is testimony to their popularity. The new Yamaha 2017 BB434M Bass Guitar retains the vintage beauty that made this range so popular but adds some new and improved appointments. If you want powerful tone and exceptional comfort, then the BB434M will prove very appealing. 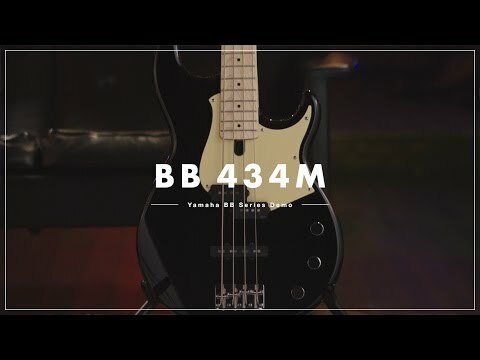 The BB434M benefits from the natural lightweight feel and rich fundamental tone of Alder, a popular choice for many guitars and bass guitars all over the world. This is shaped to a double cutaway shape meaning that you can reach the higher notes on the 34" scale length neck with ease. The body is complete with a delicious vintage finish and complimentary pickguard. The neck of the Yamaha 2017 BB434M Bass Guitar is crafted using a 5-piece maple and mahogany and is shaped to a comfortable profile that will feel natural in the hand. The satin finish of the neck also means that you will be able to glide up and down over longer performances without any discomfort. Married to the neck is the smooth maple fingerboard complete with 21 frets and simple dot positional inlays to guide your performance. Atop the neck sits the black headstock complete with lightweight open gear chrome tuning machines and the Broadbass branding and motif. The Broadbass BB434M is certainly built to impress so it's only fitting that Yamaha give equally superior pickups. To this end you get the firepower of a YDG single coil in the bridge position and a split single coil pickup in the middle position. Both come with Urethane wire for isolation and Alnico V magnets for rich frequency pickup culminating in a very precise and harmonically rich tone. This can be shaped thanks to the inclusion of a volume control for each pickup and a master tone knob to change the "colour" of the sound to your liking. Completing the feature set of the BB434M is the inclusion of an adjustable vintage style bridge with strings thru body design offering excellent sustain and intonation, a graphteq TUSQ nut and improved protection against warping thanks to a 6-bolt neck joint. The Yamaha 2017 BB434M Bass Guitar gives you the premium bass experience without the premium price tag.